The cast of Mrs. Murray's Menagerie. Photo by Ben Arons. BOTTOM LINE: A funny and quirky devised piece by The Mad Ones. Collaboration in theatre is challenging enough when a script's parameters are fully defined. But when the text of the play is an unknown variable, the result can easily become an exercise in chaos and anarchy. But it seems to work perfectly for The Mad Ones. Their chemistry is inspiring, and their creativity appears to be born of a burst of joy. Watching them perform together is not unlike watching a rock band jam. Their energy and focus is in perfect sync, and they are keenly aware of and always connected to one another. This company is a cohesive, singular unit that all ensembles strive for, but very few ever achieve. The premise of Mrs. Murray’s Menagerie may be simple, but it’s wonderfully quirky and hilarious. Set in the ‘70s, the play centers on a focus group of parents who have been asked to share their feedback on a television show for toddlers. The parents have been asked to brainstorm their impressions of each television character and interpret the message that it communicates to their child. Inevitably, each parent’s answer exposes a whole set of biases and assumptions that often rub the others the wrong way. The participants never air their annoyances with one another; they do their very best to keep a lid on everything they are feeling. But their silent contempt for one another feels more menacing and dangerous than an open conversation would. Hilarity ensues as we relate to the excruciating self-control that it takes to get along with people who don’t share our views. Ah, the joys of living in a civil society. That’s the whole show. The plot does not thicken. There are no twists or turns. The characters dutifully endure a one-hour session together—trying to avoid the urge to punch someone in the nose—and then return to their regularly scheduled workdays already in progress. Under the direction of Off Broadway favorite Lila Neugebauer, Mrs. Murray’s Menagerie is being presented by Ars Nova at Greenwich House, as part of their new residency. Despite seeing numerous productions here when it was called the Barrow Street Theatre, I hardly recognized the venue: its entire architecture feels reconstructed. 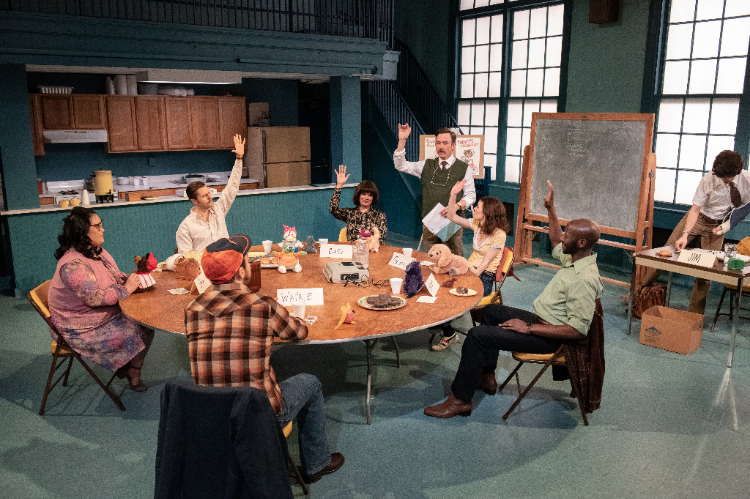 Set designers You-Shin Chen and Laura Jellinek have completely reimagined the space to make the whole theatre feel like the American Union Community Hall in which the play takes place. More than the story or the script, the truly remarkable creations here are the individual characters. The play uses little expositional language to deliver information, but we thoroughly understand every character long before play’s end. For example, Roger (Joe Curnutte) is easily insulted but doesn’t understand why others perceive him to be racially insensitive or misogynistic. Gloria (Stephanie Wright Thompson) suffers from a lack of confidence and the fear of not pleasing others, but also feels that she is under-heard and under-appreciated. Dale (Brad Heberlee) is thoroughly annoyed by his job and everyone in the room, but strictly sticks to a script approved by corporate and never gives voice to personal opinions. Every single character is nuanced by layers of learned behavior and the detailed costume design brilliantly conceived by Ásta Bennie Hostetter. While Mrs. Murray’s Menagerie is a delight, it does require patience. The first half of the focus group session goes off without a hitch, which means that for much of the play, there is not a single conflict in sight. While this gives us plenty of time to observe the characters’ quirks and idiosyncrasies, you may find yourself wondering (as I did) what am I watching, and why? But by the end, my enjoyment flourished because I felt like I had gotten to know each character intimately. Mrs. Murray’s Menagerie is unlike any play I have ever seen. (I missed last season's acclaimed Miles for Mary, which was also developed by The Mad Ones using the same method of collaborative improvisation and workshops). If you are hungry for new experiences, or are someone who is okay with little-to-no plot as long as there are rich, nuanced characters, I highly recommend that you give The Mad Ones a shot with this piece. But if you're someone who feels that theatre often tries your patience, then you might find Mrs. Murray's Menagerie more aggravating than entertaining. Mrs. Murray's Menagerie is created by The Mad Ones and Phillip James Brannon, Brad Heberlee, Carmen M. Herlihy, and January LaVoy. Directed by Lila Neugebauer. Set Design by You-Shin Chen and Laura Jellinek. Costume Design by Ásta Bennie Hostetter. Lighting Design by Mike Inwood. Sound Design by Stowe Nelson. Music by Justin Ellington. Lyrics by Michael Dalto. Stage Manager is John C. Moore. The cast is Marc Bovino, Phillip James Brannon, Joe Curnutte, Michael Dalto, Brad Heberlee, Carmen M. Herlihy, January LaVoy, and Stephanie Wright Thompson.